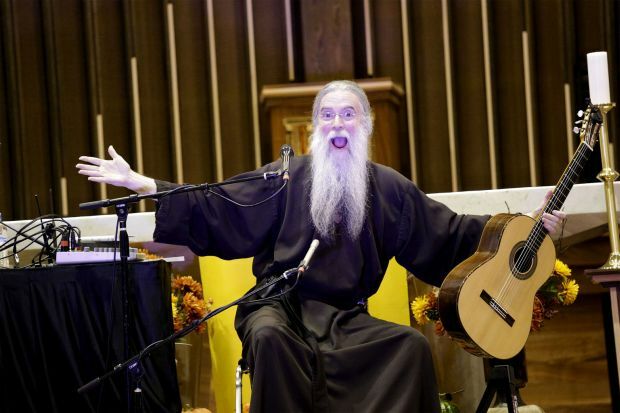 SIOUX CITY, Iowa (CNS) — During his two-day mission in Sioux City, contemporary Christian musician John Michael Talbot was by turns a comedian, a guitarist and a theologian. “All things are possible with God!” he exclaimed at St. Michael Church and urged those present to repeat after him. It was those words, Talbot insisted, that would turn the tide against the bad news that just 17 percent of those who identify themselves as Catholics attend weekly Mass. To counter that exodus, he focused his mission message on two dynamics — better singing and better preaching. “That will translate to a deeper-engaged encounter, a personal relationship with Jesus,” said Talbot, who is the founder of the Brothers and Sisters of Charity at Little Portion Hermitage in Berryville, Arkansas. Raised a Methodist, he joined the Catholic Church in the late 1970s. Talbot takes his message on the road to convalescent homes, inviting residents to raise their hands and twitch their fingers. “I call it praise-ercize,” Talbot proclaimed and then with perfect comedic timing, added an open-mouthed grin. “It’s not about learning how to say ‘consubstantial,'” he said, eliciting more laughter at the word, which means of the same essence. It replaced the phrase “one in being with the Father” in the Nicene Creed in the revised edition of the Roman Missal implemented in Catholic churches Nov. 27, 2011. Bringing the liturgy to life must include bringing liturgical music to life, Talbot said. Talbot paired better music with better preaching. Talbot shared his music with the crowd. Clad in an unadorned monk’s robe, he had a high-tech receiver clamped to his rope-belt that reverberated songs through an equally impressive Bose sound system. His guitar riffs illustrated why the former Mason Proffit member could still rock with the best. Talbot was part of that band with his brother, Terry, in the early 1970s. Then, both embraced an evangelical brand of Christianity and started releasing albums infused with Christian themes. John Michael Talbot became a Catholic in 1978. Even with terrible music and boring preaching, Talbot said, there is one reason why Catholics need to be at Mass. “Get with the program of good singing and good preaching!” Talbot’s voice rang out in a “Sinners in the Hands of an Angry God” reverberation. The current situation could be summed up in a “Dr. Phil” quote. “How’s that workin’ for ya?” inquired Talbot — the only Catholic presence on Trinity Broadcasting Network — who began sharing his televised messages of hope and inspiration each week on “All Things Are Possible” last year. Talbot’s prayer was that after his mission, Mass would never be the same again for those in attendance. “We have to have a revival in America, in our parishes, in our lives,” he said. Those who go to mass for “the show” are missing the point. Much of which passes for “good” music in the Catholic church is trite with sappy sentimentality. There are Protestants that have problems with Catholic music, but they are usually “high church” Anglicans who have beautiful, reverent liturgies. People are not leaving the Church because of “bad music and bad preaching”. They are leaving the Church because of poor catechesis and and lack of commitment to learning and practicing their faith. Much of this is due to the breakdown to the family. Same old. Same old. This kind of crap has been emptying churches for over 40 years now; but this type of person never seems to catch on. Let’s follow VII and give Gregorian Chant “pride of place” in our churches. Maybe then we can stop the bleeding. Mass is about your individual interaction with the Lord in a very special way. The problem is over the last 40 years we have turned it into a performance and a show. This is what the Proestants did and we all know their churches are more empty than ours! Do you still pray the rosary during Mass? The Mass is a communal prayer – not an individual one. We are the “body of Christ”. A good preacher really breaks open the Word for us and brings it alive and challenges us to live the Gospel. Good music lifts people up – he who sings prays twice according to St. Augustine. And I don’t know where you live, but the Protestant churches in my neighborhood are filled with ex-Catholics.